When it comes to interviews, the longer the better! Why? Because it give us a chance to both learn and know more about our favorite artist. 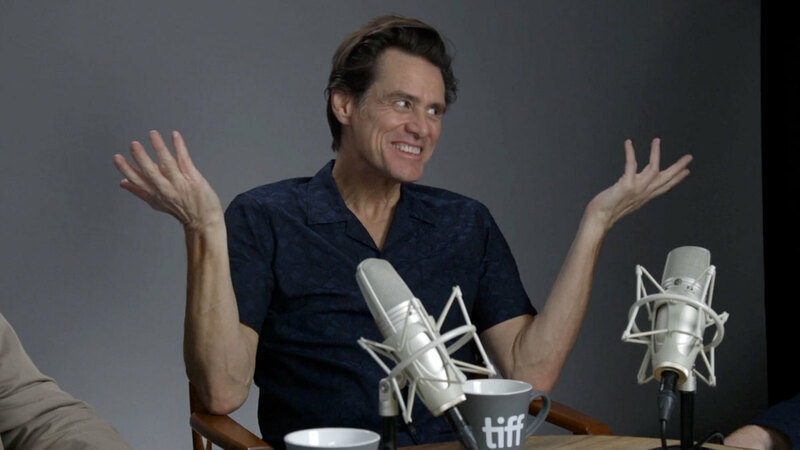 Recently, while at the Toronto International Film Festival, Jim Carrey was interviewed for 27 minutes for 'TIFF Long Take' by Rob Kraszewski and Geoff Macnaughton. The interview opens with laughter, not only because of a joke Jim made with water in his mouth but also when he told a story of how him and his father took a "bogus" course to be radio/TV personalities. When asked what was the first character he remembers doing, Jim mentions 'The Carol Burnett Show' and talks about the very known story of the rejection letter he got when he sent a letter to them, asking to be on the show: "(…)I didn't care it was a rejection letter. I just got a letter from Hollywood. I was happy. (…)"
"There was never any other choice. From the time there was consciousness in the body, I was looking at a man named Percy - my dad - who was the most incredible character that you'd ever meet. If you met him for five minutes you thought you knew him for fifty years and he wrapped every one that came into our house in stories and jokes and they left my house always with pee stains. (…) From the first time I can remember him just lighting up the room and him just like wrapping everybody in a story or whatever and going oh that's the thing I want to do, that's what I want to be." "Kind of a odd like at first like everybody with Andy is like what am I watching here I'm used to Carol Burnett and I'm used to people presenting themselves and I am so-and-so and here's my gig you know and this guy just twisted it all around he didn't care about the form and he was a challenge to form itself so I had to process it." "I'm finding that people are all kind of for the most part accepting of another kind of way of looking at things or letting go of character. I believe in an energy of God, energy of, you know everything is divine. There's nothing that isn't divine, everything is divine and I'm that. I'm not the body, I'm you guys, I'm this thing and this thing and the cameras and it doesn't matter to me what's happening on them. (…)"
Jim continues to talk more about what he believes saying it's a "knowledge that has been evolving" and that "he had to become famous and get all the stuff that people dream about and accomplish a bunch of things that look like success in order to give up his attachment to those things." "Yeah they're attracted to whatever that magnetism is at that time. I don't really look for things and it's the same with painting and sculpting and whatever. I'll just start and it happens that later on my subconscious mind told me something just like the scripts tell me something about where I was at you know and so they find me you know I and that's why I disappear for long periods of time(…)"
Jim continued to explain his beliefs, saying that he use to pay "Jim Carrey": "I don't exist so they're all characters that I played including Jim Carrey including Joel Barish (Eternal Sunshine of the Spotless Mind) including any of those things. They're all characters you know. Jim Carrey was a less intentional character because I thought I was just building something that people would like but it was a character you know so I played the guy that was free from concerns so that people who watched me would be free from concern (…)." Going back to Andy Kaufman, Jim says he's "very happy" about that fact that a new generation will be able to be introduced to Andy again. Another amazing interview that allows you to get to know Jim Carrey a bit better. -- Source: TIFF. Click to comment this article.